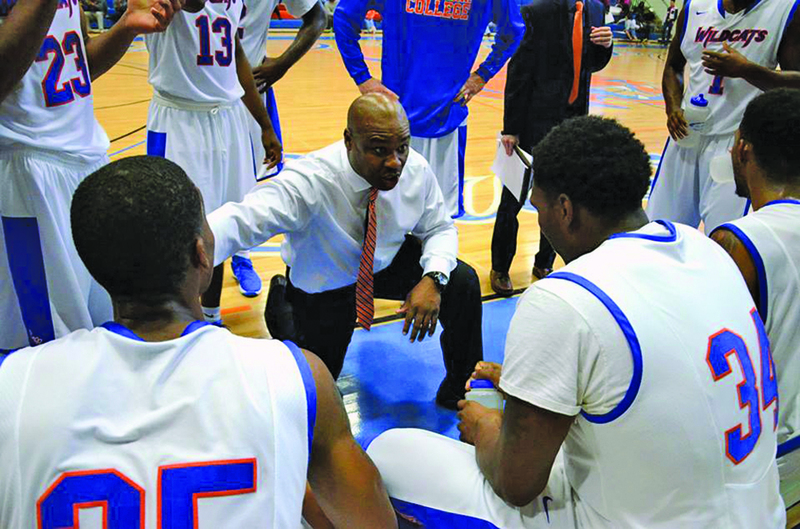 PINEVILLE – As the man following in the footsteps of legendary Louisiana College basketball coach Gene Rushing, Reni Mason knew the 2015-2016 season would pose a challenge. As a matter of fact, it would have been challenging regardless who followed Rushing, an LC icon who retired last year after 29 years as the Wildcats’ coach. The team, though, exceeded expectations, Mason said, explaining that the team made a first-ever trip to the American Southwest Conference Tournament Championship game. Louisiana College head men’s basketball coach Reni Mason instructs players during a timeout from a game in the recently completed season. “For seven years I coached at Evangel Christian Academy [in Shreveport] and I really enjoyed it,” said Mason. As Evangel’s head basketball coach, he guided the Eagles to a 154-53 record and three district titles in 2010, 2011 and 2015. He led them to the LHSAA Top 28 twice, including a runner-up finish in Class 2A in 2011. “However, it wasn’t until the last year or so there did I start to think about getting back into college basketball,” Mason said. The 44-year-old Mason played collegiately at Louisiana Tech before transferring to the University of New Orleans. He also spent several years as a college assistant — at Division I UNO and Division II Minnesota-Morris — as well as stints as an assistant coach in the United States Basketball League and as coach of a touring team in Atlanta. “This opportunity at Louisiana Collage was presented by God, and I thought it was imperative I listen to the voice of God,” Mason said. Mason was a late entry into the pool of more than 75 applicants but quickly made the short list, making a strong favorable impression on the search committee. “When we did the phone interview and narrowed the search down, he was an overwhelming candidate at that point. He was one of six we brought in, and just like the phone interview he was overwhelmingly the top interview with the committee,” said Louisiana College Athletic Director Dennis Dunn. Louisiana College president Rick Brewer also was impressed with Mason from the start. “From my initial meeting with Coach Mason, it was obvious to me that he was a winner on every level; professionally, personally, and spiritually,” said Brewer. The Wildcats started the season 2-8, but were able to catch their stride after Christmas and posted a 12-4 record, including an impressive 7-1 mark at home in ASC play and a conference tournament run to the championship game. Changing the culture of a program is nothing new to Mason. Evangel Principal Albert Dean and Head of School Jerry Erickson used those same words to describe what Mason did in his seven years in Shreveport. “As a former player, I saw the change in the culture of the program when he came. He brought discipline and gave those young men a sense of purpose. He instilled a real sense of godliness in their lives,” Dean said. “You think at a Christian school like Evangel everyone may be that, but that’s not always the case. “That’s a narrow title; he really became a discipler of all of our kids,” Erikson explained. “He was speaking into the lives of hundreds of kids on a daily basis. He was not easy. He challenged them all to live a moral life, to live a godly life, challenged them to put into practice the discipline that would allow them to be successful long term. “From day one, Reni has been faithful to the call of God, the will of God, and the purpose of God. He fulfills the Word of God to go make disciples. Yes, he’s excellent at his craft, basketball, solid in his fundamentals, those are all great things, but even more importantly, he cares about the heart and the character of each young man that he is responsible for,” Erickson said. With a season under his belt, Mason is excited about the future of the program and continuing what God has called him to do — coach basketball and pour himself into the lives of students all over the campus. “Since we’ve been here, God has put us in positions where we can really mentor young adults. In high school we dealt with adolescents; now we’re dealing with men who are transitioning into the real world,” Mason said. “We feel very fortunate God has blessed our family with this opportunity at Louisiana College. I’m a great believer that the Lord will not bless me and not include my family. I think it’s important that our young men learn the value of family and the importance of harkening to the voice of God,” he noted.